Trading the forex market can be extremely challenging if you are relatively new in this industry. There are many traders in this industry who have lost all their hard earned money by using the wrong trading technique. One of the most common mistakes that every trader makes is using too many indicates in the chart. Some might say that using the indicators is totally unnecessary since they tend to give to many false trading signals. But in the eyes of trained professional indicators can be extremely useful if the traders combine them with the right tools. In this article we will tell you how to use the stochastic indicator like the professional trader and trade the key support and resistance level in the market. Before we move in to details lets us know first know a bit about the support/ resistance level and the stochastic indicator. Support and resistance level is considered to be one of the most key tools for the traders. Support level is such a place where the market finds fresh buying pressure or in another word after hitting a key support level market generally rally upwards. On the contrary resistance level is such a key area which restricts the bullish move of the currency pair that is after hitting a resistance level the pair falls sharply in the market. But as a professional trader you must know that all the significant support and resistance level are broken at certain times. To be precise most of the breakout of the key support and resistance level occurs in the event of the major economic news releases. The stochastic indicators is one of the most popular indicator in the forex industry. This is often called as leading oscillators since it gives early signals in the market. Professional traders uses this indicator to identify the potential overbought and over sold conditions of the currency pair. But if the stochastic indicator is used in compliance with the key support and resistance level then the best trading setup can easily be identified in the market. Let’s see how the professional traders use the stochastic indicator along with the key support level. In the above figure professional traders used the normal stochastic indicator in order to identify the oversold and overbought of the currency pair. If the indicators is in oversold mode during the testing of the critical support level then professional traders enter long into the pair. On the contrary if the pair hits a critical resistance level in the market and the indicators shows an overbought reading then the traders execute their short order in the market. But trading the key support and resistance level with the stochastic indicators can be extremely tricky at certain stages since stochastic indicator generates lots of overbought and oversold signals in the markets. Professional traders always ignores all the overbought and oversold signals in the market when the price is trading far from the key support and resistance level. Professional traders wait patiently for the retest of the key support or resistance level in the market to enter long order or short order in the market. 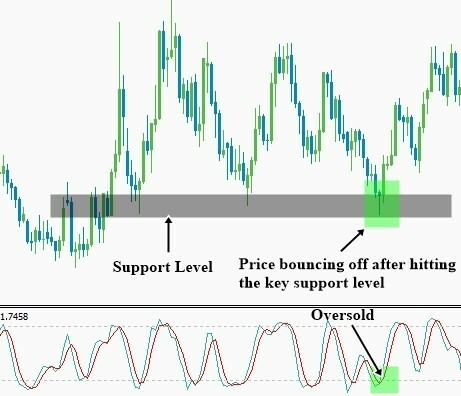 Though this is the simple trading technique using the stochastic indicators many professional traders also use price action confirmation signal in this trading strategy to achieve better accuracy in their trading performance. But make sure that you are not using aggressive trading strategy during the event of the major economic news release since most of the breakout occurs at that time. The use of price action trading strategy using the stochastic indicator is pretty much similar to support and resistance trading. Professional simply uses the highly reliable candle stick pattern to execute their trade order in the market at the key support and resistance level. In the above figure a bullish pin bar war formed right at the key support level of the market. When the bullish pin bar was formed professional traders then look for the confirmation of the stochastic indicator. If the value of the stochastic indicator is oversold then they execute their long order in the market. In the above figure a classic advanced price action trading technique is shown by using the stochastic indicator and key support level. But it’s not necessary to use price action confirmation signal at the key support level since most of the time price respects the key support or resistance level in the market. There are two type of traders in the forex market. The aggressive traders always take entry without any price action confirmation signal but on the contrary the conservative traders use the price action signal to execute their order. Summary: If you truly want to become successful in forex trading then you must consider forex trading as business. If you think forex trading as get rich quick scheme then be sure that you will be losing tons of money. As a professional trader you must trade with proper risk management factor. Most of the new traders fails in this industry due to lack of their trading discipline. As a professional forex trader you must maintain a trading journal. Some might prefer online trading journal but in real life trading online trading journal trading doesn’t works properly. So make sure that you have a nice trading journal and make notes for each and every single trade that you execute in the market.